Download the Branson Hills Golf Club mobile app to enhance your experience. Mobile apps contain many features like scorecard, GPS, tee times, news, deals and more! Click on the icons for more information and free download. Season: Open year around weather permitting. 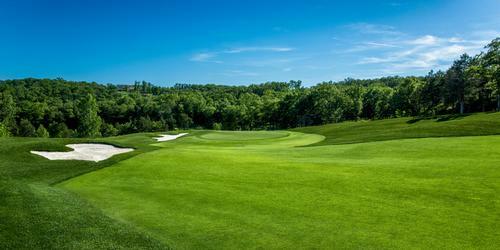 Branson Hills Golf Club, formerly Payne Stewart Golf Club, is a tribute course honoring Legendary Missouri Golfers. Each hole at Branson Hills Golf Club is interwoven with a story of Payne Stewart's life and golfing experiences throughout his career. Click here to view hole descriptions. Branson Hills Golf Club is nestled in the picturesque Ozark Mountains surrounding Branson and offers golfers a one-of-a-kind golfing experience. Playing at 7,324 yards, this championship course challenges even the most advanced players. The course was designed by Chuck Smith with design consultant and PGA Professional, Bobby Clampett. Please call 417-337-2963 for current rates. Call 417-337-2963 for rates and tee times. Tee Times are allowed 60 days in advance. If you have a group of 16 players or larger, please contact either Dan Davis or Austin Fickel to discuss a group discount, our added services and extended booking times. Tee times that are to be cancelled, must be cancelled 48 hours in advance or you will be held responsible for your booking (excluding poor weather). Credit cards and a valid phone number and email are required at the time of reservation to hold the tee time. Individual and Family Memberships are available. 100, 150, 200 yard plates, 150 barber poles in the middle of the fairways, all sprinkler heads are marked with distances to the center of the green. Payne Stewart is the choice for your next Branson golf tournament, corporate outing or family event. With this outstanding "all inclusive" facility located only 7 minutes from the Branson Convention Center, Payne Stewart Golf Club has become the #1 choice for many State Association Golf Tournaments. Your tournament participants will be awe struck at the natural beauty of this award winning golf course as it winds through beautiful hardwood forests accented by dramatic elevation changes, majestic rock outcroppings, crystal clear Ozark streams and abundant Missouri wildlife. The Payne Stewart Golf Club Staff specializes in customizing Branson golf tournaments based on individual needs. For groups of 16 players or more, our tournament staff will work with you to organize and manage every aspect of your event. We strive to make your job as tournament coordinator, a painless and successful pleasure. Whether you are organizing a corporate outing for your company or clients, a golf fundraiser for your favorite charity, or just a casual day of fun with your friends we are at your service! -Group pricing tailored to fit your budget. -Off course event coordination- Putting Contests, Shoot-outs, etc. The Payne Stewart Golf Club will provide a variety of options to handle all your food and beverage requirements for your event. Please contact, Head Golf Pro Dan Davis, for rates and information if you are organizing a group of 13 or more participants. Branson Hills offers top of the line wedding banquet facilities for every season. Imagine saying your vows in our grand hall (pictured above) or on our large outdoor balcony overlooking the 18th green (pictured below). After the ceremony and while wedding party pictures are taken, your guests can enjoy an assortment of champagne, cocktails and hors d'oeuvres. You can have an unforgettable reception in the luxurious dining area, grand hall or pool deck. We also offer exquisitely prepared food by our Chef that is sure to please all your guests' palates. Our in-house wedding coordinator at the Branson Hills is here to help you with all the details of your wedding ranging from color choices to flowers, from the dream wedding cake to the perfect location. Our desire is to help you realize your dream wedding. From the smallest details to the largest, nothing will be overlooked. We look forward to being apart of this special day in your life! Please give me a call today with any questions, and to begin planning your once-in-a lifetime wedding! Please contact the Hamption Inn of Branson Hills (800 yards from our clubhouse) for more information about lodging including the Hampton Inn, the Eagle Bunker Condos or the 2 or 4 bedroom Golf Villas located on property at 417.243.7800. Stay and Play Packages are available. We have a full service restaurant on-site and we would also love to cater your next event! 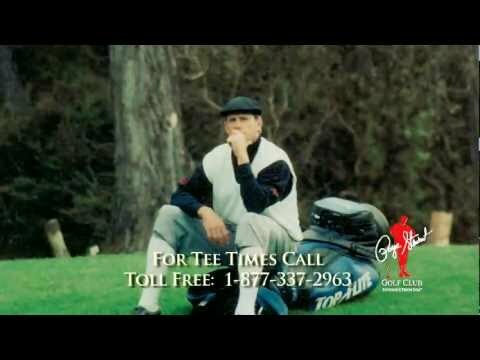 Watch the Payne Stewart Golf Club Video. This profile was last updated on 04/07/2016 and has been viewed 17,759 times.